Hardware Platform: Laptop. PC2700 DDR-333 200-Pin. Item as in title and picture. 4x 1GB DDR2 SODIMM. 1x 1GB PC-2 6400 800Mhz Hynix. 1x 1GB PC-2 5300 667Mhz Hynix. MODULES: 50x 1GB = 50GB. TYPE: DDR2 SDRAM. THIS ITEM IS USED AND MAY HAVE SLIGHT MARKS OR SCRATCHES ON. HYNIX HMT112S6BFR6C-G7 1GB PC3-8500S DDR3 SODIMM REFURBISHED. They are each 1Rx8 PC3-10600E DIMM's. They have been fully tested and work perfectly. These were removed from an HP Z400 for upgrade. Matching set of 3 Hynix HMT112U7TFR8C and matching set of 3 Samsung M391B2873EH1 for perfect compatibility in the two banks of three slots inside the Z400. They were pulled from an HP laptop that was upgraded. Each stick is 1GB DDR2 PC2-5300S, so 4GB in total.They have been fully tested before removal with no errors and work perfectly. As the sticks are from a matching kit set, you will have no compatibility challenges with this set. Type: DDR2 SDRAM. Capacity: 1GB. Bus Speed: PC2-5300 (DDR2-667). 4GB 4x 1GB DDR2 FB DIMMS PC2 6400 (Compatible with PC2 5300f). ORIGINAL Apple Mac Pro Ram Modules. To work with 2006 - 2008 Mac Pro Towers Desktop Workstations. 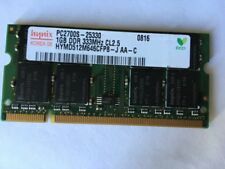 Hynix 1GB DDR2-667 (PC2-5300) RAM HYMP112U64CP8-Y5 240-pin DDR2 SDRAM. CAPACITY 1GB. 100% perfect condition. TECHNOLOGY 240-pin DDR SDRAM. FEATURES 6-layer PCB. ERROR CHECKING Non-ECC. CAS LATENCY CL5. Useful information. Price information. Note, picture is of actual item. What you see is what you get . Bankers Draft. Credit or Debit Cards. IT Computer Spares. Type: SODIMM DDR2. Speed: 667Mhz. Capacity: 1GB. Part number HYMP112S64CP6-Y5 AB. Form Factor: laptop ram. Taken from a working laptop, tested and in good condition. They were pulled from an HP workstation that was upgraded and has the HP part number 444908-051. Each stick is 1GB Reg DDR2 PC2-6400E, 240 pins, so 4GB in total.They have been fully tested before removal with no errors, are working perfectly and you will have no compatibility challenges with this set. HYNIX Apple Mac Pro 3,1 2008 Ram 8GB (8 x 1GB) 800MHz PC2-6400F. RAM Taken from working PC machines and tested. Worldwide: £10. Tested and Working. Price is for ONE Module. Type: DDR2 SDRAM. Capacity: 1GB. Bus Speed: PC2-6400 (DDR2-800). Tested and working well, great condition. Grab a bargain. 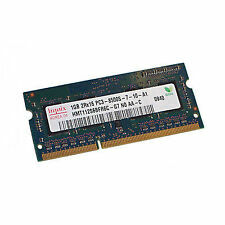 Hynix 1GB 1Rx8 PC3-10600U-9-10-AD HMT112U6TFR8C - H9 NO AA-C.
hynix 1x 1GB 2Rx16 Pc 3-8500S-7-10A1 memory cards ECO. Condition is Used. Dispatched with Royal Mail 1st Class Large Letter. 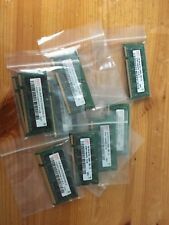 10 x 1GB PC2 - 6400U 240pin Memory DIMMS. Samsung and Hynix branded. Removed from a number of Dell OptiPlex computers as part of a hardware / software upgrade, these Modules are in good clean condition and all work perfectly. Used extensively in PC's of various Makes, these Modules are an ideal cheap way to upgrade a number of computers. Pins 240 Pin. Capacity 1GB. Data Transfer Rate 1333Mhz. In good condition and in full working order. Micron Part Number MT8HTF12864AY-667E1 / HP p/n 377726-888 - Picture is of the actual module that you will receive. Each module is 1GB PC3 10600S-9-10B1. 2Rx8 PC2-5300S-555-12. Hynix DDR2 RAM SODIMM. Photos may show more details. Tested - system boots with it installed, shows correct value in bios.